Tumbling commodity prices may have blown a hole in Australia’s budget, but the OECD has told policymakers not to panic. Nevertheless, there was little Christmas cheer in its latest forecasts for the “Lucky Country,” with the Paris-based international economic organization suggesting Australia’s consumption tax should be hiked to up to 18 percent from the current 10 percent, among other reforms to boost growth. Releasing Tuesday its latest economic survey of Australia, the OECD said the general government balance of the world’s 12th largest economy had been in deficit for six straight years – “unusually for Australia” – with gross public debt climbing to 30 percent of gross domestic product (GDP) from 20 percent before the global financial crisis. “In the absence of active fiscal consolidation measures, such as those presented in the government’s budget, progress in deficit reduction is projected to be slow and somewhat bumpy…even with the help of fiscal drag,” the report said. “The global economic crisis and associated fiscal stimulus, and more recently, the tailing off of resource-sector investment provide a partial explanation for the deficit situation. However, there has also been an over-commitment to costly spending initiatives and tax cuts,” the OECD said. Despite Australia’s relatively low public debt compared to the rest of the OECD, the organization said a “conservative approach” to fiscal policy was necessary, due to the nation’s exposure to potential external risk, “particularly from resource markets,” together with the substantial private sector debt. Slumping prices of the nation’s key exports of coal and iron ore have hit government revenues, with Australian Treasurer Joe Hockey announcing Monday that the federal budget would not be in surplus until the end of the decade. The budget deficit for the current fiscal year will now reach an estimated A$40 billion, more than A$10 billion larger than the May forecast, amid shrinking export income and also political opposition to A$10 billion worth of planned spending cuts. “In the last six months unforeseen events have hit the Australian economy. In particular, we are now witnessing the largest fall in the terms of trade since records began in 1959,” Hockey said in a statement. 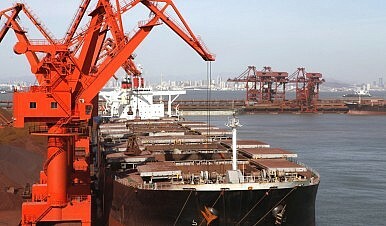 He pointed to a 50 percent fall in the iron ore price and a 20 percent dive for wheat, with such price falls leading to an expected A$32 billion reduction in tax receipts, while slow growth in wages and employment has added to the fiscal pressures. Despite criticism by shadow Treasurer Chris Bowen that the government’s promised surplus “has been put off to the never never,” Hockey said newer and higher taxes had been ruled out. “To try and recover these falling revenues now through newer higher taxes would unquestionably harm the Australian economy,” he said. Indicative of the fiscal threats facing the nation’s budget, on Tuesday the HSBC Flash China Manufacturing Purchasing Managers’ Index dropped to 49.5, a seven-month low, with Credit Suisse describing China’s housing, credit and investment as being in a “triple bubble.” The growth slowdown in Australia’s largest trading partner has seen the iron ore price hit five-year lows, while the diving oil price has threatened returns from the nation’s gas exports. According to Stephen Anthony of consultancy Macroeconomics, falling coal and iron ore prices are cutting one percentage point from Australia’s GDP every year. “Right now it appears a return to budget surplus is unlikely any time soon,” Anthony was quoted saying by the Australian Financial Review, with his consultancy estimating the federal budget will remain in deficit well beyond the end of this decade. The organization’s Australia report author and senior economist Philip Hemmings, told ABC News that sudden fiscal consolidation in the wake of the mining downturn would be a mistake. In its report, the OECD noted that Australia’s goods and services tax (GST) raised only half the revenue (as a share of GDP), or 7 percent, compared with the OECD average of nearly 12 percent, due to widespread exemptions including education, food and health. It suggested reforming the GST, increasing the use of land taxes, cutting corporate tax and further changes to income tax could help reduce the burden on labor and business. While the OECD predicted output growth for Australia of about 3 percent for 2014 and 2.5 percent next year, it also called for further reforms to maintain the economy’s 23-year winning streak. These include reforming federal-state financial relations, reducing regulatory burdens on business, strengthening competition, better targeted welfare and education reforms and reducing greenhouse gas emissions. The message for policymakers was clear, though: the party is over. “Broadly speaking, the balance of risks facing the Australian economy contains more substantial downside than upside uncertainties. External risks, chiefly from commodity markets, combined with speculative activity in the housing sector and uncertainties in the responsiveness of non-resource sectors, could conspire to generate a period of weak macroeconomic activity,” the OECD said. With rising government debt and unemployment and slowing growth, Canberra’s declaration of 2015 as the “year of reform” has suddenly become an urgent task, if Australia’s dream economic run is to continue.